Lazio are reportedly considering a transfer swoop for Arsenal midfielder Aaron Ramsey as a replacement for Manchester United target Sergej Milinkovic-Savic. This shock raid would be a devastating blow for the Gunners, who have already lost Jack Wilshere and Santi Cazorla as options in central midfield this summer. Ramsey has just a year to run on his current contract and the club are keen to tie him down, with the Telegraph recently claiming they were confident of doing so, though nothing has been announced as of yet. 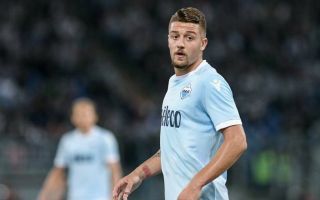 The Daily Mirror continues to link Milinkovic-Savic as a target for United, though they are so far reluctant to pay his £80million asking price. Were they to do it, however, United could deal a real blow to Arsenal’s transfer window as it might well mean them losing an important player in Ramsey, according to the print edition of Corriere dello Sport, as highlighted in a tweet below from Giovanni Capuano. Ramsey has been at Arsenal since 2008 and become one of the club’s most reliable performers. New manager Unai Emery could really do without losing such a big name so early on in his reign, so he’ll surely be hoping United don’t end up prising Milinkovic-Savic away from Lazio.